It’s so bad it’s good…. What’s “Good” about Good Friday? After all, it signifies a man abused and tortured, made to carry his own cross to be crucified, had nails hammered into his hands, a crown of thorns embedded in his head, and given vinegar to drink when he asked for water. It was clearly a very bad day. “Good Friday”, possibly the most sacred day in the Christian calendar, appears to have been diminished by our secular and consumer led society. It’s certainly a good Friday for the new deities of consumerism – for the shopping malls and superstores, whose temples are open for worshippers. It’s a good day for atheists and agnostics, because they get a public holiday regardless of their beliefs. Nobody really knows why the day of Christ’s crucifixion is called Good Friday. Indeed, there is no evidence that it actually happened on a Friday. It was a convenient date which married the early Christians to Pagan beliefs back in the post-Romano era. There are two modes of thought: Good Friday was originally God’s Friday. This would make sense, because as time went by words change and develop. The Catholic Church is fairly open to this suggestion. Unlike Evangelical Bible-Thumpers who argue that it was “Good” because Christ gave his life on the Cross to save our souls. For all his suffering, it was filled with goodness they proclaim. Pre and post Romano Britain, Anglo Saxon, and medieval man would not have considered that, and certainly not the Benedictine monks who ruled with ecclesiastical hammers. Suffering and penitence was the order of the day – there was nothing to be happy about! “Christ suffered and so should you” they said. What’s good about that? Meanwhile in Spanish Dominions, the Dominican monks ruled, and they would have dictated, absolutely, their expectations and rules, and were directly linked to the seat of the Spanish throne. The Dominicans (the religious quasi political branch of the Spanish Empire) were ruthless in their endeavours. So what’s all this got to do with Good Friday? The simple answer is politics. Jesus didn’t choose Friday to die, nor did he choose Sunday to resurrect. Why? Because 2000 years ago the calender as we know it didn’t exist! Time revolved around the equinox. Rome and future Popes created the calendar – from the Julian to the Gregorian, and it was expedient for a Pope to embrace pagan celebrations aligned with Eostra – the pagan god of rebirth. Emperor Constantine (the first Pope of Power) was a very clever chap. In order to unite his empire he knew he had to embrace all and alienate none. The dates of Easter has no more credence than the 25th December – the date of Christ’s birth. Christian’s do not question the date – it’s the event that matters. Constantine needed a reference point: that which was before, and that which came after – Before Christ, and After Christ. BC and AD. My analysis isn’t an academic study, it’s merely an observation. Yet there is little doubt that significant Christian dates were aligned with Pagan celebrations – it was expedient and convenient. 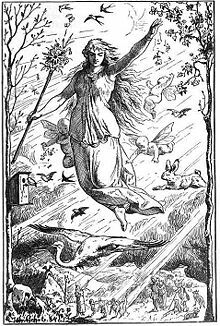 Which brings us to Ostara, or Ēostre the pagan Goddess of Dawn and Rebirth. Note the word Goddess. Christianity gave us one god – God – yet here was a goddess worshipped in pre-Christian times, and she became associated with “Easter”. How is that? Easter is the association and celebration of Christ’s crucifixion and resurrection, yet, prudently Constantine combined the two. It was Constantine who brought the papacy to power, and effectively established the Catholic Church. Does all this matter? Do dates matter? Does it matter that we have Easter eggs (another pre-Christian symbol of fertility and rebirth and don’t forget rabbits – we all know their proliferate skills). How many people actually think about that? All that matters really is what Easter signifies – the persecution, betrayal, crucifixion and resurrection of one man who changed the world. We celebrate His birth at Christmas, lament his Death, and take joy in his Resurrection at Easter. You may not believe it – but that doesn’t mean you can disprove it! Maybe that’s why it’s a “Good” Friday. Inclined to agree with your sentiments. I often wonder how people can do this to one another? So much suffering the mind actually boggles. spookmoor on A Spook(y) tale….